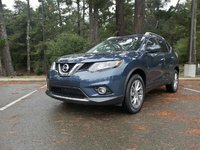 Still looking a little offbeat, but still loaded with value, utility, and posh, Nissan’s next-gen 2015 Murano shows off a bunch of upgrades to looks, roominess, and technology. Nissan has also elevated its popular 5-passenger midsize crossover to flagship status, replacing the 7-passenger Pathfinder. Among the improvements to this quirky family-oriented people-hauler are some 2.5 inches of length and 1.3 inches of girth to increase shoulder room and rear-seat legroom, while cargo capacity jumps to 69.9 cubic feet with the rear seats folded. Additionally, some new exterior trim pieces give the roof a floating effect, while the optional panoramic sunroof has also been enlarged. Additionally, the Murano’s cabin offers an even warmer, cozier ambiance for the current model year with upgrades to materials and fabrics. Oh, and it should be mentioned that the uber-quirky Murano CrossCabriolet is dropped for 2015. Expect the new-look Murano lineup to return in the base S, the lower-midlevel SV, and the upper-midlevel SL trims, with the top-shelf LE trim renamed the Platinum. Once again, all versions are delivered sporting standard front-wheel drive (FWD), but each can once again be equipped with available intelligent all-wheel drive (iAWD) in case some wintry weather is in your future. Power-wise, the standard engine remains a 3.5-liter V6 mated with the returning continuously variable transmission (CVT). Some fussing with performance and efficiency, however, has Nissan touting up to 20% better fuel economy from this capable combo that returns pumping out 260 hp and 240 lb-ft of torque. 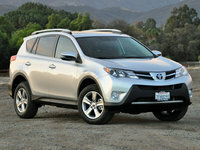 Mileage is now ballyhooed to be 21 mpg city/28 highway in both FWD and AWD editions. Towing, by the way, remains maxed out at 1,500 pounds with the proper equipment. Gracing the new-look 2015 Murano profile are, depending on the trim selected, such standard appearance features as 18-inch alloy wheels (20-inchers on the Platinum), new-for-2015 LED running lights and taillights, and heated power-adjustable mirrors. Inside, again depending on the chosen trim, look for cloth or leather-trimmed upholstery, reclining rear seats, heated and ventilated power-adjustable front seats, full power accessories, cruise control and telescoping tilt-wheel steering (power-adjustable in the Platinum). Of course, a rear-view camera is also standard across the lineup, as is dual-zone climate control, while higher trims throw in a standard auto-dimming rear-view mirror and a remote garage door opener. Also new for 2015 is an upgraded 7.0-inch NissanConnect infotainment screen that in lower trims can be swapped for an available (and also improved) 8-inch screen that comes standard in higher trims and additionally boasts voice-activated navigation and smartphone-interfaced mobile apps. Meantime, entertainment includes a 6-CD changer with 6 speakers and auxiliary audio input in lower trims, while upper-level trims add a standard 11-speaker Bose premium system boasting satellite HD radio. Also standard in the SL and Platinum trims are such extra perks as memory for driver's settings and remote engine start, while the Platinum justifies its high-end status with stuff like heated rear seats, a heated steering wheel, and climate-controlled front seats. 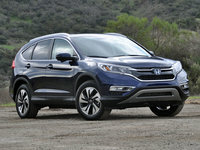 Optional equipment in lower 2015 Murano iterations includes a number of items that are standard in higher trims, while a panoramic power moonroof that’s been upsized for 2015 remains optional for the SL and Platinum versions. 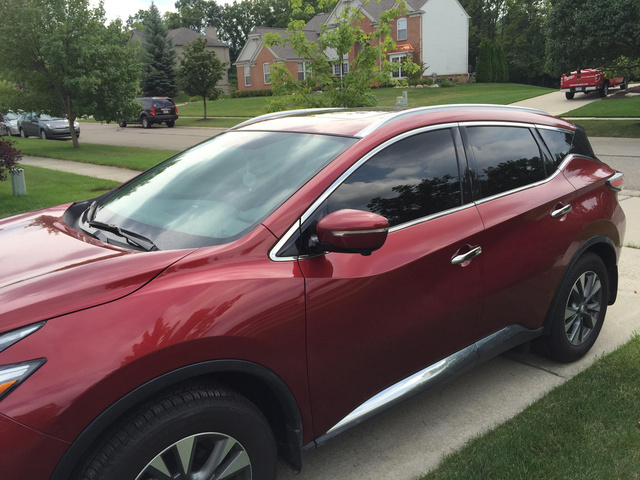 Standard safety equipment aboard the redesigned 2015 Murano, finally, includes 4-wheel antilock brakes (ABS), front side-mounted airbags, front and rear head airbags, LED daytime running lights, turn-signal-integrated mirrors and a remote antitheft alarm. An around-view camera system that’s new for this year is standard in the SL and Platinum trims, while the SV, SL, and Platinum strut standard front fog/driving lights. Said higher trims are also eligible for such available safety stuff as forward-collision alerts and braking, blind-spot monitoring, and intelligent (adaptive) cruise control. What's your take on the 2015 Nissan Murano? 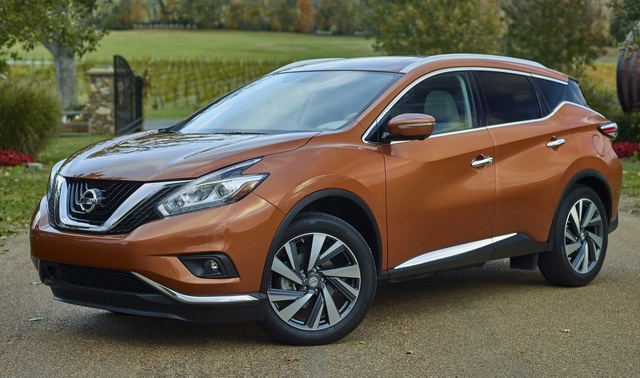 Users ranked 2015 Nissan Murano against other cars which they drove/owned. Each ranking was based on 9 categories. Here is the summary of top rankings. Have you driven a 2015 Nissan Murano? My 2015 Murano Shows A Tire Icon On Screen. Tire Pressure Is Hood.